Data before the (alternative) facts. Ambiguity and uncertainty, cultural richness, idiosyncracy and subjectivity are par for the course when it comes to humanities research, but one mistake that can be made when we approach computational technologies that proffer access to greatly increased quanta of data, is to assume that these technologies are objective. They are not, and just like regular old fashioned analogue research, they are subject to subjectivities, prejudice, error, and can display or reflect the human prejudices of the user, the software technician, or the organisation responsible for designing the information architecture; for designing this supposedly “objective” machine or piece of software for everyday use by regular everyday humans. It is important to recognize that when we organize data into categories (according to population, gender, nation, etc. ), these categories tend to be treated as if they were discrete and fixed, when in fact they are interpretive expressions (Drucker 2011). This correlates with Rosenberg’s idea of data as rhetorical, and also with Rita Raley’s argument that data is “performative.” Like rhetoric and performance then, this means the material can be fashioned to reflect the intentions of the user, that it can be used to falsify truth, or to insist that perceived truths are in fact false; that news is “fake news.” Data provided the foundations for the arguments voiced by each side over the ratio of Trump inauguration attendees to Obama inauguration attendees, with each side insisting their interpretation of the data allowed them to present facts. 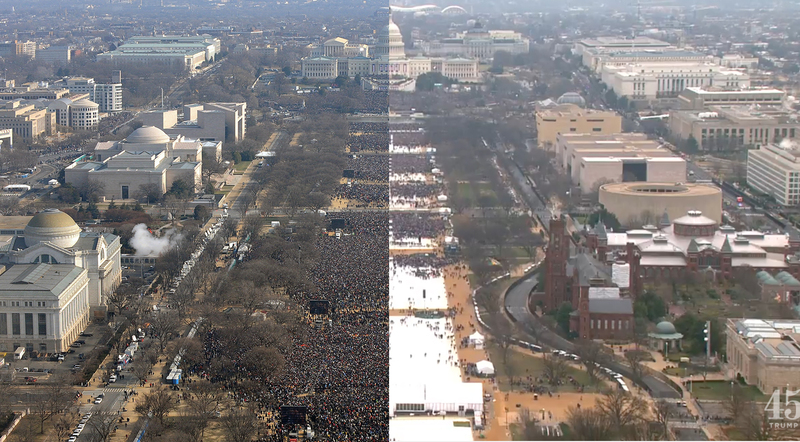 So “Graphics reveal data,” and it was to graphics that people turned in response to Conway and Spicer’s assertions regarding the “alternative facts” surrounding Trump’s inauguration crowd. Arguably, these graphics (below) express the counterargument to Conway and Spicer’s assertions in a more innately understandable way than any linguistic rebuttal, irrespective of how eloquent that rebuttal may be. But things don’t end there (and it’s also important to remember that visualisations can themselves be manipulated). Faced with graphic “alternative-alternative facts” in the aftermath of both his own assertions and Conway’s defense of these assertions, Spicer countered the visual sparsity of the graphic image by retroactively clarifying that this “largest audience” assertion incorporated material external to the datasets used by the news media to compile their figures, taking in viewers on Youtube, Facebook, and those watching over the internet the world over. The “largest audience to ever witness an inauguration, period” is, apparently, “unquestionable,” and it was obtained by manipulating data. Daniel Rosenberg, “Data before the Fact,”’ Gitelman, “Raw Data” is an Oxymoron, 18. Borgman, “Big Data, Little Data, No Data,” 17. We can of course refer to Orwell’s 1984 and the “2+2=5” paradigm here. Karin van Es, Nicolàs López Coombs & Thomas Boeschoten, “Towards a Reflexive Digital Data Analysis” in Mirko Tobias Schäfer and Karin van Es, The Datafied Society. Studying Culture through Data, 176. Rita Raley, “Dataveillance and Countervailance” in Gitelman, “Raw Data” is an Oxymoron, 128. Rosenthal, “Introduction: Narrative Against Data in the Victorian Novel,” 6. Previous postHow can use be made of NAs? Next postA recipe for intimacy? Pingback: Will Big Data render theory dispensable?